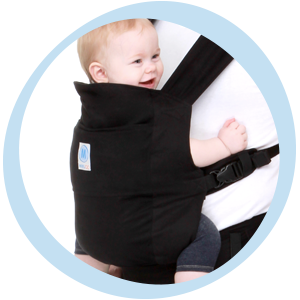 If your little one is not yet 15lbs, please use one of our other carriers. 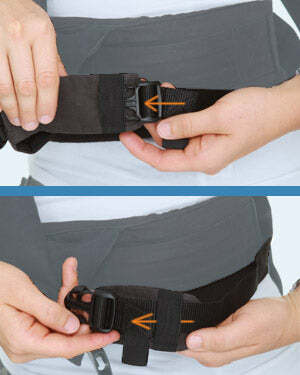 1 GET READY Before putting on the carrier, cross and secure the shoulder straps. Make sure to run the hook end of each side buckle through its safety elastic and fasten to the catch end. Listen for the CLICK to ensure secure attachment. Fasten the waist belt buckle at your back. Listen for the CLICK. Tighten as comfortable. 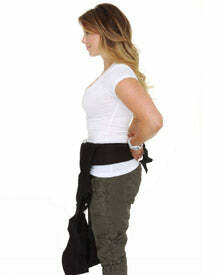 2 Slip both shoulder straps over your head, making an "X" on your back. Now you should have a pouch with enough room to comfortably insert baby. Tip: Keep shoulder straps flat for comfort. 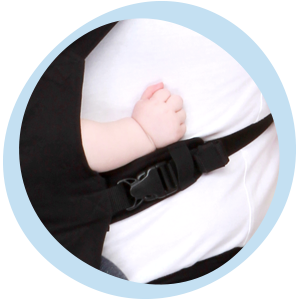 3 Carefully support baby as you place her into the body of the GO Carrier. Baby's legs should come out of the lower side openings and hug your stomach. 4 Lift and hold baby to your body. Tighten side buckles as needed for a comfortable, secure fit. Before you GO, do some safety checks!